I found what I thought was a rug for my new house's bathroom. I bought the magazine without looking at the pattern. Then I discovered it was a doily pattern. 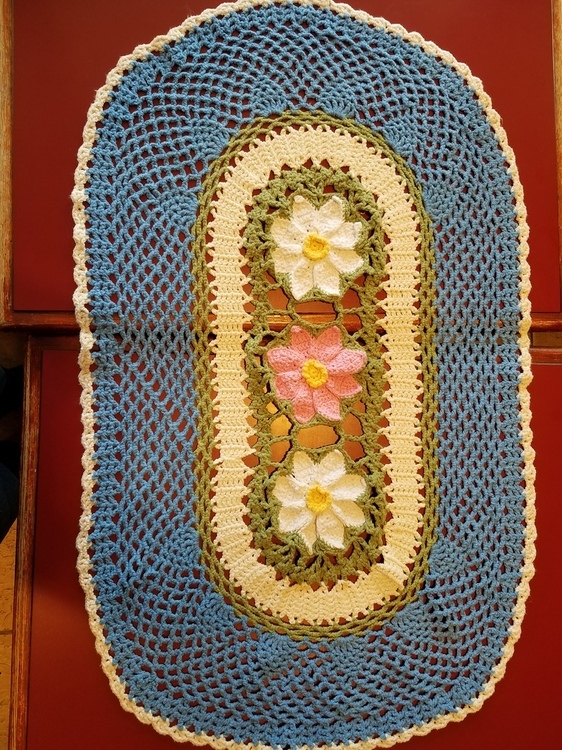 So, I made it as a doily, using #10 cotton thread and as a rug, using ww cotton yarn. oh, i looked at the magazine pics you linked, the cover photo does look like it's on floorboards! Pretty as a doily or a rug! I didn't notice that the magazine's pic had a background that looks like a floor. Maybe subconsciously that's what made me think "rug." I had to change the rug to 3 flowers. When I did 5 flowers, it was bigger than the floor space. I had to rip back and cut 2 of them. Fortunately I noticed soon after they were connected. With 3 flowers it's the size of a large bathroom rug. 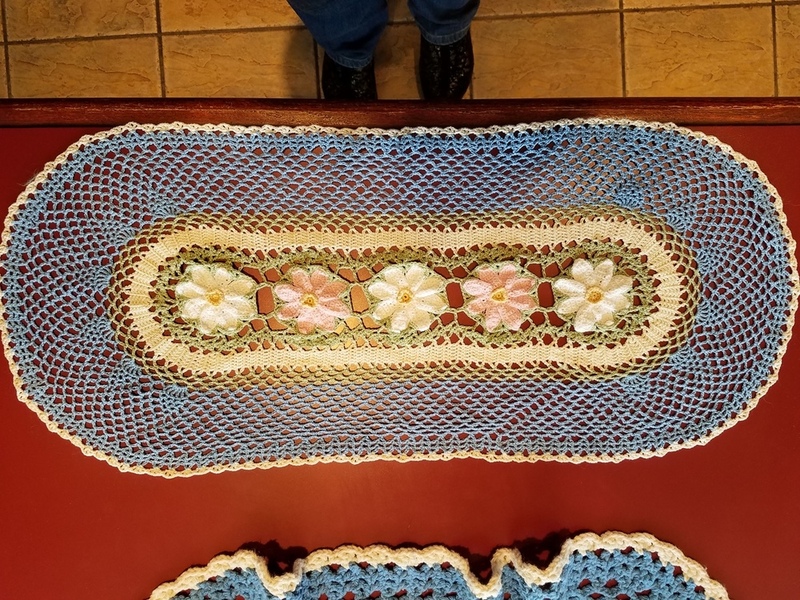 The doily covers most of the top of a dresser. I remember that magazine. I loved that pattern, but never got around to it. 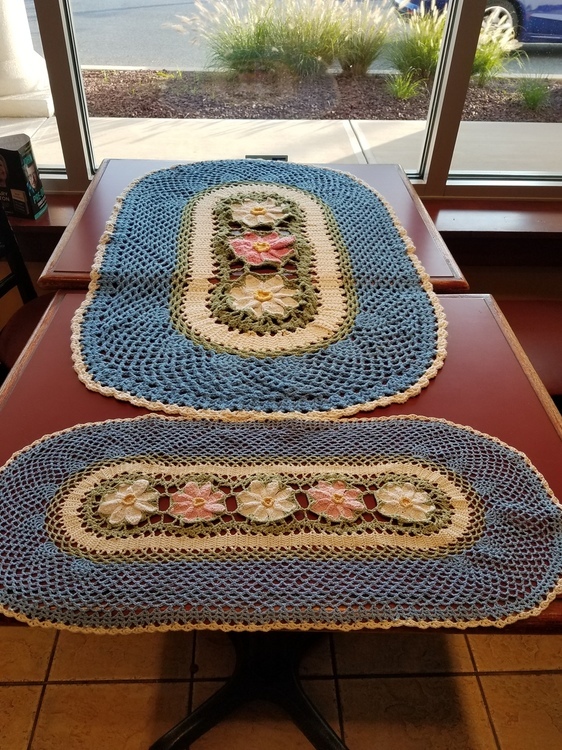 The rug is perfect, and the doily is so pretty. They look great together. That rug and that doily looks beautiful! . You did great work on that. I really like that design and those colors. That dos look like a rug on that magazine- picture.